Using Bluetooth technology, the iRig BlueBoard connects to its companion iOS app and gives musicians hands-free wireless control of mobile and Mac music apps. The iRig BlueBoard provides the foot-controlled functionality and convenience of a pedalboard, and provides a way to control parameters in music making apps, like stompbox effects on/off, preset patch-switching on the fly, volume or wah control, or any other MIDI controllable function. 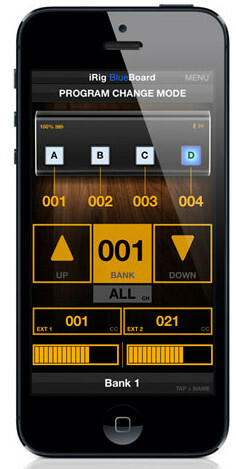 iRig BlueBoard is expandable, so musicians can add up to two standard additional expression pedals or footswitches via the unit’s two TRS 1/4″ expansion jacks. The unit’s wireless range is 10 meters (over 32 feet), and the footswitches are backlit, so should be able to see the buttons in the murkiest of clubs (although we imagine they’ll form a tempting target for the light fingered if positioned too close to the edge of the stage). The iRig BlueBoard is a wee little thing, measuring 27 cm wide x 9 cm deep (10.6″ x 3.5″) and only 2 cm (0.8″) tall and is powered by 4 standard AAA batteries. 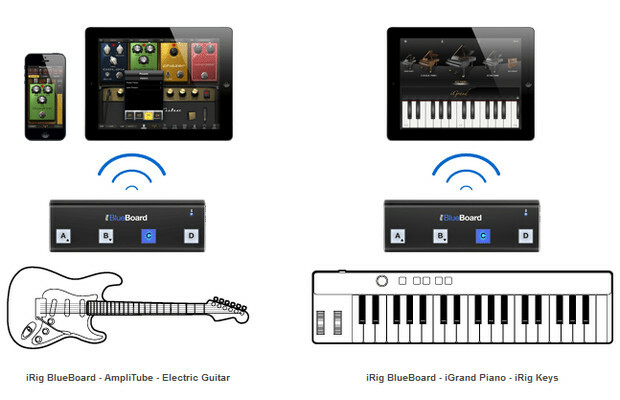 iRig BlueBoard is compatible with iPhone 5 and 4S, iPad 3rd and 4th generation, iPad Mini, and iPod touch 5th generation. For Mac, it’s compatible with any model that supports Bluetooth 4.0 / Bluetooth Low Energy, like any MacBook Air, Mac Mini, or MacBook Pro that was released after June 2012.